Highly esteemed throughout the Middle East for thousands of years, myrrh oleoresin was used as an ingredient in incenses, cosmetics, perfumes and medicines. Along with frankincense, elemi, opopanax and benzoin, myrrh is one of the oldest medicines derived from a resin, and has been traded as a commodity for over 3,000 years. Myrrh was extensively used by the Ancient Egyptians, most notably in the sacred incense dedicated to Isis known as ‘Kyphi’, which was eventually used to treat all manner of ills as well as for religious ceremonies. Due to myrrh’s remarkable ability to preserve flesh, it was employed by the Egyptians in their unsurpassed embalming processes, the results of which are still intact today as can be seen in museums around the world. Myrrh was also used by Egyptian women as a cosmetic ingredient to reduce wrinkles and preserve a youthful complexion. Over 2,000 years ago Arabia was the centre of the ‘Spice Trade Route’ where aromatics and herbs were traded, and none were more valuable than myrrh and frankincense. Considered sacred to the gods, the use of such resins was initially confined to incense for divine worship rather than medicine. During the early trading years demand outstripped supply, quickly making myrrh and frankincense the most sought after resins with a value equal to that of gems and precious metals. To deter thieves, it was claimed that these precious gum-bearing trees were guarded by fierce red snakes that leapt in the air to inflict fatal bites to hapless intruders! From North-Eastern Africa and the Arabian Peninsula, myrrh resin was transported across inhospitable deserts by the Arab merchants for distribution to Assyria, Babylon, China, Egypt, Greece, Rome and Persia. There are many references to the use of myrrh in the Old and New Testaments of the Bible, the Koran, and also Greek and Roman texts. Commiphora myrrha is a small deciduous tree or bush reaching a height of only 2 or 3 metres, with a short trunk and pale grey coloured bark. The branches are sturdy, gnarled and knotted with smaller branchlets that protrude at almost right-angles, terminating in sharp spines. The scanty leaves are small, oval and trifoliate, causing the tree to present a very spiny and spiky appearance. Fruits are brown, oval, about the size of a pea, and small flowers blossom just prior to the rains. 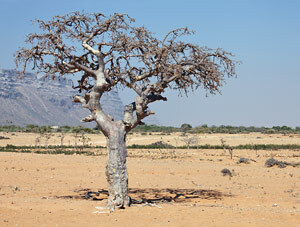 Commiphora myrrha grows in north-east Africa, Somalia, Yemen, southern Arabia and Ethiopia. To collect the oleo-gum resin, workers cut deep incisions into the bark which causes the pale yellow aromatic liquid to exude. 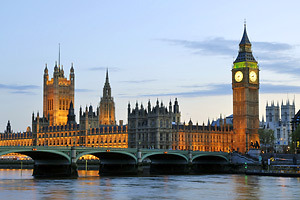 With exposure to the air this liquid slowly begins to harden and dry into yellow or reddish brown ‘tears’ that are covered in a grey or yellow powdery dust. After a few weeks the dried drops of resin are scraped off the bark or collected from the ground, after which it is cleaned and graded prior to distillation. The resin contains antiseptic, antibacterial, antiviral, anti-fungal and anti-inflammatory compounds. A major part of myrrh resin collection takes place in Somaliland between November and February. Myrrh essential oil is extracted from the oleo-gum resin by steam distillation. The oil is yellow-brown in colour and has a warm, balsamic odour with bitter overtones that makes its aroma quite unique. 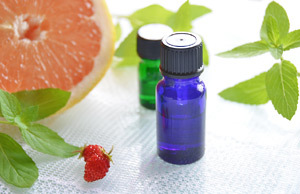 In aromatherapy, myrrh is classed as a base note. 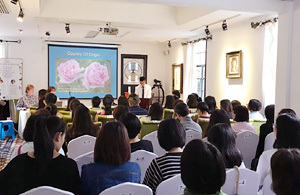 An absolute and resinoid are also produced by solvent extraction, but these are mainly for use in the fragrance and flavour industries. Myrrh essential oil has exceptional healing, antiseptic and fungicidal properties, and is particularly useful on slow healing wounds, hives (urticaria), weeping eczema and athletes foot. Add a few drops of myrrh oil to a carrier lotion and apply twice daily to treat these conditions. A footbath is an excellent way to treat athletes foot; simply add 2 drops of myrrh plus 2 drops of tea tree oil and soak for 5 minutes. Follow up with an application of the same formula in a lotion for the best results. This oil is also very effective for treating dry, chapped and cracked hands during the winter months, and a few drops added to a carrier cream or lotion massaged into the skin can work wonders. Many aromatherapists use myrrh essential oil in the battle to minimise wrinkles because of its ability to stimulate cellular renewal. Myrrh is a great skin care oil. Since myrrh oil has expectorant properties it is valuable for treating coughs and colds, plus it has an anti-inflammatory effect that can be helpful when treating arthritic conditions and for reducing swelling. One drop of essential oil applied to mouth ulcers can bring relief from this annoying and troublesome affliction. The warm, balsamic and slightly bitter odour of myrrh essential oil blends nicely with benzoin, bergamot, cedar atlas and virginian, cinnamon, clary sage, clove bud, cypress, elemi, frankincense, ginger, juniper berry, lavender, marjoram sweet, patchouli, rosemary, sandalwood, tea tree, and vetiver. 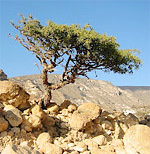 Myrrh trees seem virtually indestructible, and can be seen thriving in the most hostile of desert conditions where little else can survive. These small, thorny trees can even grow in dry, stony ground among boulders and rocks where there is seemingly no soil whatsoever! There are 17 separate references to myrrh in the Bible. Myrrh was included in many holy anointing oils, such as the one that Moses took with him when he lead the children of Israel out of Egypt.